Because out there, riding the rails, stalking the camps, is the scarred vagrant who murdered Connelly's daughter. No one knows him, but everyone knows his name: Mr. Shivers. 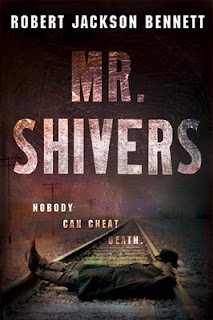 To celebrate yesterday being the most visited day ever on Mad Hatter's Bookshelf I have an ARC of Robert Jackson Bennett's horror debut Mr. Shivers to give away to one lucky person. To enter send an email to madhatterreview (AT) gmail (dot) com with your full name and snail mail address and "SHIVERS" in the subject line. The deadline is midnight February 12th. I'll announce the winner on the following day. This contest is open to the people of the United States and Canada only. If you send multiple entries you will be disqualified from the contest. Definitely check out the cool site Orbit put together to support Mr. Shivers and here it the book trailer.